1. According to The Guardian, 166 photographs– never seen by the public before–are going on display at the Ulster Folk and Transport Museum. 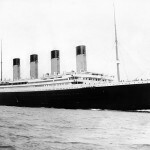 The photos show Titanic during her launch at Harland & Wolff on 31 May 1911. Images from Olympic are also included. 2. The Atlanta Business Journal is reporting a new appraisal of the Titanic artifact collection held by Premier Exhibitions is now worth $218 million. The appraisal was done by The Alasko Co. The previous appraisal set the value at $189 million. The appraisal only covers the artifacts and not any of the intellectual or archaeological assets by Premier Exhibitions.